iRealHousewives | The 411 On American + International Real Housewives: Foxtel Finally Reveals Whether Or Not The Real Housewives Of Melbourne Will Continue! Foxtel Finally Reveals Whether Or Not The Real Housewives Of Melbourne Will Continue! Foxtel is finally revealing whether or not The Real Housewives of Melbourne will return for a fifth season. Foxtel's executive director of television Brian Walsh officially confirmed to TV Tonight that the hit reality series may in fact return - with some changes. Unfortunately, the Sydney installment did not have the same fate. He officially revealed The Real Housewives of Sydney was not returning for a second season. “Sydney won’t happen again. Once bitten twice shy,” he added. Late last month, Matchbox Pictures, the producers of the show addressed Season 5 rumors. Our good friends over at @housewivesau shared an email that they've received from the production company. 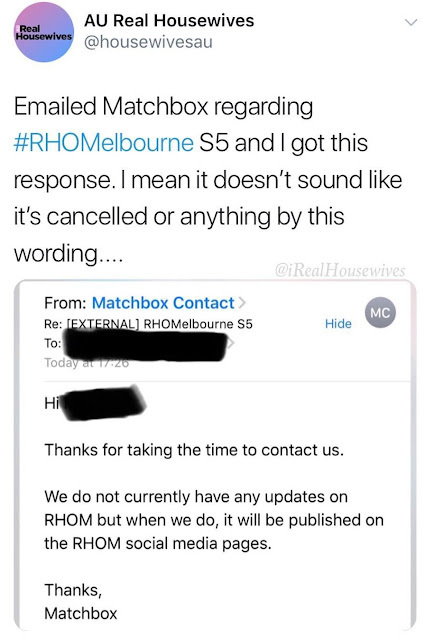 "Emailed Matchbox regarding #RHOMelbourne S5 and I got this response," shared the fan page on Twitter. "Thanks for taking the time to contact us," wrote Matchbox via email. "We do not currently have any updates on RHOM but when we do, it will be published on the RHOM social media pages." After the fan page shared the email on Twitter, LALATE replied and insisted that the show will in fact return this year. "#RHOM starts filming in less tham 90 days," said the outlet. The fan page replied: "Is this for real?!" In which they responded: "Yes." As previously reported, LALATE claimed that the current cast members are not aware if new cast members are joining the show, or if they will be invited back. Despite some ladies teasing that the show has been renewed for another season via their social media pages, sources reveal that "no decision has been made yet by Foxtel." Apparently, the network "will reveal to returning cast members this February who is coming back, and who is (if at all) joining the cast as a newbie for 2019." The outlet revealed that "two cast members were rumored to leave, one might exit, and two are being tested."